Slice the baby marrows. Flatten the hot, boiled potatoes slightly and arrange next to the marrows in a baking dish. Drizzle with olive oil, season to taste with salt and pepper, and sprinkle the cheese over the marrows. Bake for about 30 minutes or until cooked. Dip the fish fillets in the cornflour and season well with salt and pepper. Heat the oil in a heavy-based pan and shallow-fry the fish until golden brown and cooked through. 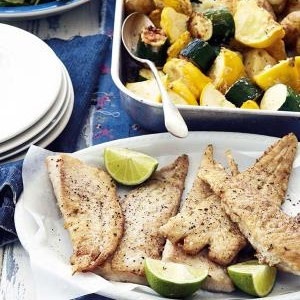 Serve with the potato bake and lemon wedges.